Side Arms (Japanese: サイドアーム? ), also known as Side Arms: Hyper Dyne, is a side-scrolling shoot-'em-up originally released by Capcom as a coin-operated video game in 1986. The game was also released to the TurboGrafx-16, as well as to various home computer platforms. In Side Arms the player takes control of a flying mecha suit who must battle an alien army. Side Arms uses a two-directional attacking system similarly to Capcom's previous shoot-'em-up Section Z. An evil alien empire known as the Bozon are launching a full-scale attack on Earth. As either Lt. Henry or Sgt. Sanders, the player must pilot a giant space mecha known as a "Mobilsuit" to defeat the aliens. Up to two players can play simultaneously. Source: Wikipedia, "Side Arms Hyper Dyne," available under the CC-BY-SA License. Let the Battle for Survival Begin! It is light years into the future and there is trouble in your sector. The galaxy is being threatened by an unknown nemesis from a distant black hole and you, earth's lone, interstellar warrior must stop the terrible destruction at hand. Armed with only your government issued sidearm you must use your brains as well as your brawn to avoid ambushes, collect treasures and expand your arsenal of weaponry in preparation for your ultimate battle with the dreaded Nemesis 10. Will the earth be saved from the fury of the evil empire, our fate is in your hands-Good Luck! 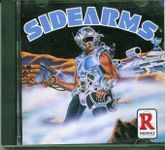 Sidearms is a shooter, the player can choose to attack towards the right side of the screen, or left. Power ups are available.